From our beginnings, we Friends have held that one place is not more sacred than another -- all places are fit for the worship of God. And early on we established a sort of generic Meetinghouse look -- free from the ornamentation and classic cross arrangement of most Christian churches. This architecture stayed consistent among Friends (regardless of persuasion) until the rise of the pastoral movement. Then the buildings of Friends churches (primarily) began to resemble other church buildings of the time they were constructed. For example, I've been in Friends churches constructed in the late 19th and early 20th century and they look a lot like the Methodist, Lutheran, Presbyterian, et al churches built in that era -- often following the Akron plan (the name came from the First Methodist Episcopal Church of Akron, Ohio) which was based on increasing Sunday school attendance. Some even have a modified bell tower -- sans the bell, of course! This trend continued. The congregation I grew up in (Highland Avenue Friends) moved from a building that was a modified Akron plan building into a modern, straight lined building with Sunday school wings growing off each side of the sanctuary. Yes, we used the the word sanctuary. About the only thing that differentiated the Westgate Friends Church building from the Lutheran, Wesleyan, Nazarene, Evangelical United Brethren and other church buildings of the 50s and 60s was the lack of a cross hanging in the front above the pulpit. Which is fine, I think, for most preaching-centric or rite-centric faith groups. If the proclamation of the Word is the primary purpose of a faith group, then naturally the congregation should face the place where that Word is going to be preached. Also, if the acts of taking communion or baptism were central expressions of the faith, then it makes sense to be looking at the altar where the Host was consecrated or the font or pool where baptisms would take place. But it really doesn't fit what Quaker worship should be about -- welcoming the presence of Christ in our midst. The very nature of this seating arrangement puts the focus on people and performance -- not on God. We, who worship in such a setting, then look through our fellow worshippers (or the back of their heads) to a preacher, a worship leader, a choir to take us through the parts of worship in the same we we would sit in an auditorium to watch a play. We, except for congregational singing, mostly observe. We participate mostly in singing -- which is preplanned. But mostly we sit and watch others. There are three reasons for doing this. One is so that our view changes from looking at a particular place where ministry will come from to one where our view is that ministry could come from anywhere in the room. Which would also imply "from anyone" in the room. It moves us from an expectation that others will do worship while we watch to watching for where the Spirit is moving (both externally -- in the room -- and internally -- in our souls). The second reason is that it acoustically makes sense for Quakers. Sitting in pews that all face one direction does not make it easy to hear vocal ministry that arises from the people seated in those pews. Yes, some congregations have ushers who rush a microphone to a person who stands to minister, but that seems to me to be almost an act of sabotage to the holiness of that moment. It breaks the holy stillness to have someone hurrying to bring a microphone to the speaker. Sitting facing each other means we can hear each other. We will not be scattered all around the room looking away from each other. The third reason is that we actually will behold our fellow worshippers and not just gaze at the backs of their heads. We will see the faces of those God has gathered that day. We will see the joy, the sorrow, the expectation, and all the other emotions that are writ large on our visages. As we see the gathered community we can be moved to pray for them, care for them, love them. As with ditching bulletins and programming, this part of my modest proposal is fraught with difficulty, I suppose. We have huge investments, emotionally and financially, in our buildings. Our parents were married there or our grandfather was on the trustees who bought the pews or it would just be too expensive to move everything. But maybe, if we want to revitalize the Quaker message for this time, it is worth the investment emotionally and financially. For some congregations it may mean, like the video above, rearranging the pews in the sanctuary and making it a Meetingroom. (I would advise speaking with an architect about that and not just unscrewing the benches and moving them around -- but that's my congregational consultant side kicking in). For other congregations it could mean moving out of the Meetingroom to some other location in the building. Leave the Meetingroom configured as it is for things such as weddings or public events and use another space for worship. 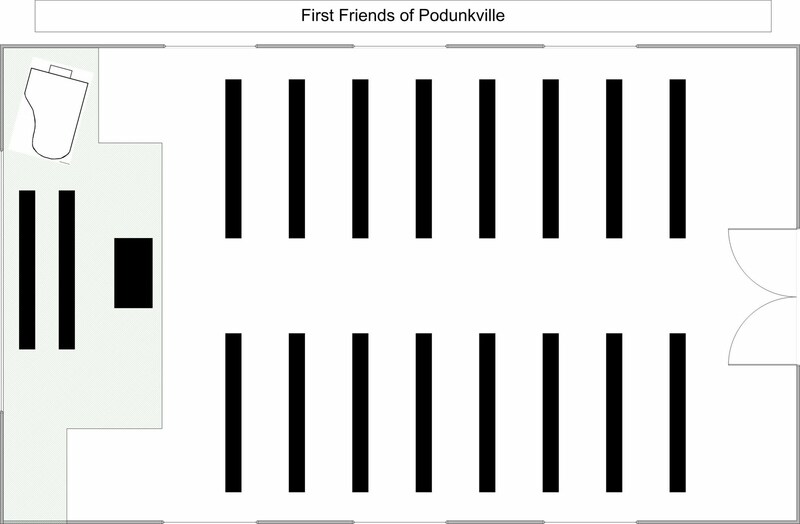 It would be no difficult task to put chairs in a circle or square. Indeed, setting up just a few more chairs that the number of folks who usually comes to worship can help us feel as if we are "full" rather than worshipping in a big mostly empty space. And have chairs ready to add if the Spirit moves new people to join. So that's part five of my modest proposal. Obviously, it applies mostly to programmed Friends. I think unprogrammed Friends have their own architecture issues -- among which could be replacing the benches that have been there since 1766 to something a week bit more comfortable. But unprogrammed Quakers have largely kept to the original Quaker architectural ethos. Let's rearrange our worship space so that we look to Jesus and look at each other. 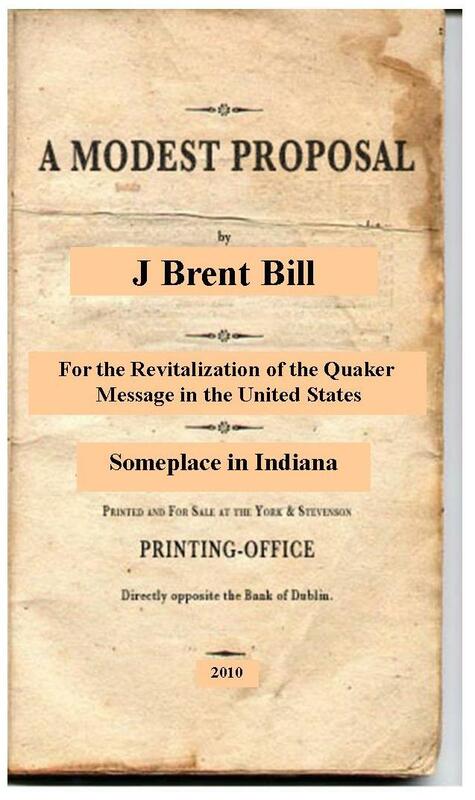 Brent - thank you so much for your "Modest Proposal". You speak to a variety of my conditions. Your words, and the robust commentary on them from other weighty Friends I admire, fills me with hope that we are still a faithful people, still full of the energetic questions that guided our ancestors. I hope God will bring us to each other soon, as it is my firm belief that the union of the faithful can only happen face to face. I also really like the Association of Bad Friends!